At first glance, artist James Prosek’s “North Carolina Habitats: From the Mountains to the Cypress Swamps” looks like a fairly conventional representation of art from nature. Until, that is, you notice what’s missing. Part of “Field Guide: James Prosek’s Un/Natural World,” on view at the N.C. Museum of Art until Aug. 2, “North Carolina Habitats” is a large wall-sized mural. In monochromatic silhouette, it depicts wildlife common to the state – ranging from ravens and barred owls to creatures both endangered (red wolf) and extinct (Carolina parakeet). For the apparent purpose of identification, each animal is numbered. But when you look for a corresponding key to match names with the numbers, you’ll discover that there isn’t one. That was not an oversight. Prosek, a soft-spoken 39-year-old, still lives and works in the same Connecticut town where he grew up. He was at the museum for several days last month to work on setup for “Un/Natural World,” which consists of 19 works (including a large painting of a sawfish inspired by an African sawfish headdress in the museum’s permanent collection). 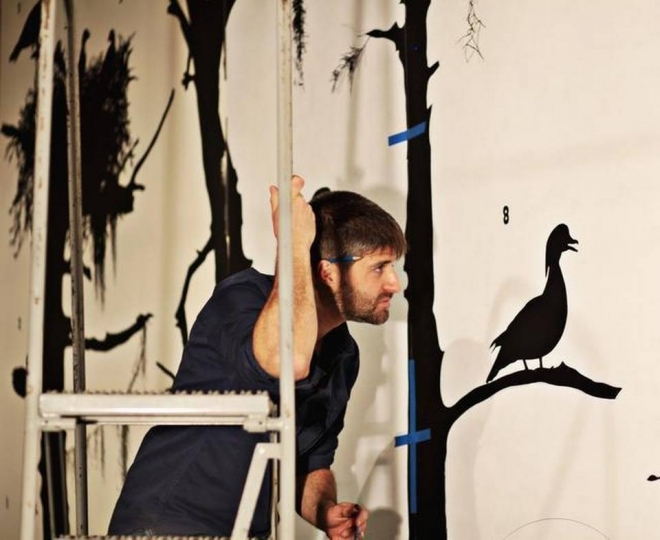 Part of Prosek’s setup process was to paint “North Carolina Habitats” on-site by hand with one of his regular collaborators, New York artist John Small. Explaining his methodology, Prosek showed a visitor the large computer printouts he put on the wall to trace the design before applying black paint with brushes. With its silhouette depictions, “North Carolina Habitats” is modeled on the end-paper illustration of American naturalist/ornithologist Roger Tory Peterson’s “Guide to the Birds” series, which goes back to the first half of the 20th century. Peterson’s books and writings were a major influence on Prosek while he was growing up and drawing birds. Even though “North Carolina Habitats” is all well-defined black-and-white boundaries, Prosek actually has an aesthetic that is highly critical of neat, easy boundaries and categories. As he admits, Prosek is prone to obsession. His language-in-nature book has been in the works for close to a decade, and it follows one that took 12 years to complete: “The Mystery of Eels,” a book and PBS documentary. That one became a project for the simple reason that Prosek found it “mind-blowing” that aquatic creatures in his neighborhood pond in Connecticut had migrated from spawning grounds in the Sargasso Sea, more than 1,000 miles away in the North Atlantic. Eels found their way into Prosek’s visual art, too. Prosek uses a stamped dead eel to make impressions, and “Un/Natural World” has the biggest such painting he’s made yet – a 10-by-15-foot canvas with the imprint repeated “about 8,000 times,” creating the impression of a swarm of them. Fascination with migration also plays into Prosek’s interest in birds, going back to when his father, a native of Brazil, would point out migratory birds that had come all the way from South America. Young James’ first ideas about categorization began taking shape during family hikes in the woods. As a multimedia artist working in a variety of fields, Prosek keeps busy with writing and filmmaking, even though visual art is his primary occupation. But each medium feeds off the other, based on an impulse to document the natural world. Over his career, Prosek has watched a lot of species disappear, which is one of his consistent themes. For a 2014 Smithsonian exhibit marking the 100-year anniversary of the death of the last passenger pigeon, he did a 40-foot mural called “What once was is no more: Passing like a thought, flight into memory,” showing a flock of the birds flying through a forest of American chestnuts. “Trout need pristine cold-water wilderness, a lot of which has been lost,” he said. “But trout have somehow survived major climactic changes. Around 13,000 years ago, where my house is now in Connecticut was under a mile of ice. Any trout there had to migrate to the ocean or perish. So if they could survive that, I hope they can survive now. Life on Earth will continue no matter what. Even when meteors hit the Earth in the time of dinosaurs and 96 percent of all life died, something did survive.